Google Fiber may be the highest-profile provider of gigabit broadband, but CenturyLink said Tuesday that the company is bringing its symmetrical gigabit broadband to several major U.S. cities. 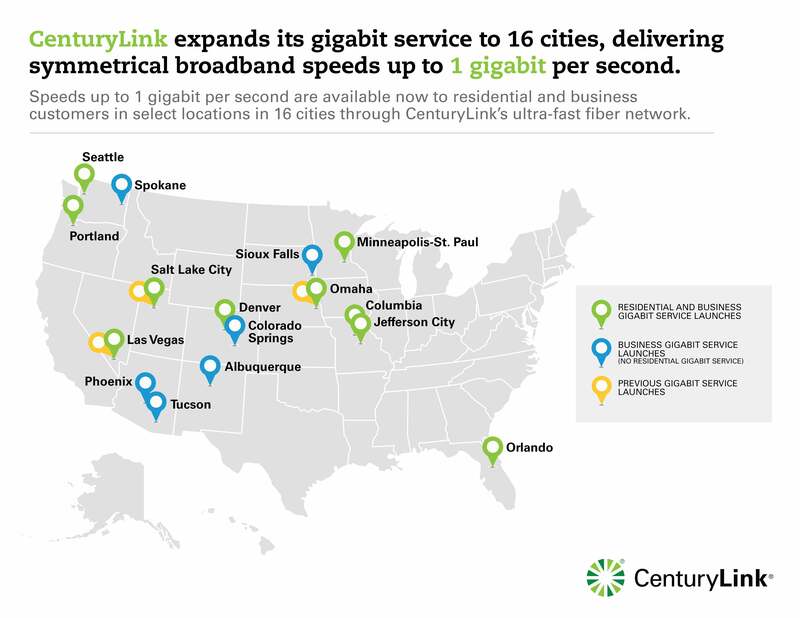 The symmetrical broadband (1 Gbit per second both downstream and upstream) will be available to both consumers and businesses with some overlap, although CenturyLink will provide the service to six cities without providing a corresponding consumer plan. 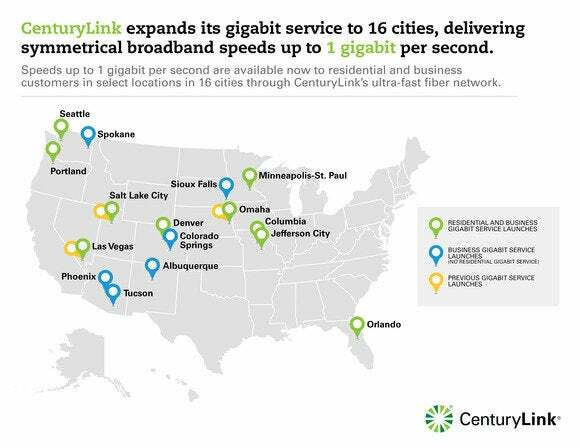 CenturyLink will provide gigabit service to both homes and businesses in Columbia and Jefferson City, Mo. ; Denver; Las Vegas; Minneapolis-St. Paul; Omaha; Orlando; Portland, Ore.; Salt Lake City; and Seattle. Certain parts of Omaha and Las Vegas already have access to the gigabit speeds. The gigabit service will also be rolled out to businesses only in Albuquerque, N.M.; Colorado Springs; Phoenix; Sioux Falls, S.D. ; Spokane, Wash.; and Tucson. Prices will begin at $29.95 per month for residential customers wishing to sign on for 40-Mbit/s symmetrical service. Customers must sign a year's contract with an early termination fee of up to $200, and they must subscribe to bundled services. They'll also pay extra for installation, modem rentals, and other add-ons. 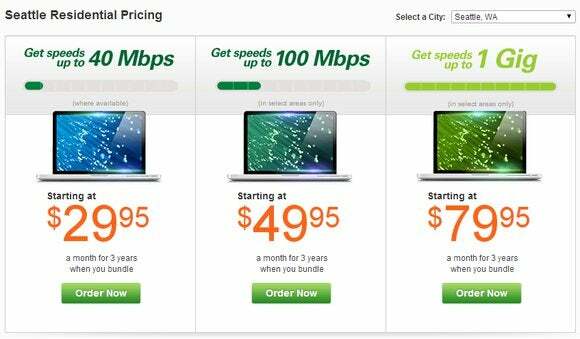 Users can also sign up for $49.95/mo, 100-Mbit/s services, or $79.95/mo for the full gigabit speeds. Broadband fiends will want to move to either Phoenix, Salt Lake City, or Portland; those three cities will probably be able to choose between gigabit broadband supplied by either Google Fiber or CenturyLink. In February, Google said it would explore extending its own gigabit service to 34 more cities, including the Bay Area. Google charges about $70 per month for a basic Internet package.